So, anyway last night as a result of various cold meds, I woke up at midnight and couldn’t go back to sleep. 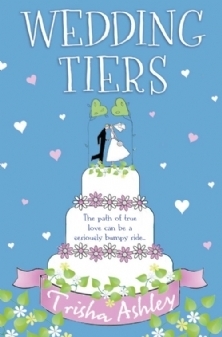 So, I read Wedding Tiers by Trisha Ashley and For Better, For Worse by Carole Mathews. I really like Trisha Ashley books in general and this was no exception. I loved the small village setting. The characters were well designed and I liked how the love triangle played out. I found the reactions of their friends to Josie and Ben’s breakup was very true to life. Charming book with a likable main character, Josie, a woman who built a life with her teen sweetheart and then had to rebuild it without him. The second book I read in my insomnia based reading session was For Better, For Worse by Carole Matthews. Quite enjoyable chick lit. Fast read. The premise of an about to be divorced woman going to be in a wedding is very promising. The writing was fast paced and the story was told from multiple view points which helped to move it along. I have to say I didn’t really like the Jack-Martha-Glen story line, but I think that is my personal issue. I don’t tend to care for the whole “infidelity just happens, everything is okay” kind of stories. I did find Josie and Matt’s story fun to read and well done with all the near misses and the final resolution. as I’m wanting to create my own site and would love to find out where you got this from or exactly what the theme is named. Appreciate it! Thanks. The theme is Dusk to Dawn on WordPress.